Chrysoberyl BeAl2O4 is a beryllium aluminum oxide mineral that resemblance like the cat’s eye. The Chrysoberyl mineral composed stone is termed as cats eye stone which constituted of Chatoyant mineral. The cat’s eye gemstone (also known as Lehsunia in Hindi) is an opaque stone. By the term opaque, we mean that a stone which does approve sunlight to pass through it. The appearance of the cat’s eye stone is distinct from the other colored stone due to a striking bright band of light on a shimmering golden background, the name Chrysoberyl derived from the Greek word which means “gold color beryl”. The following circumstances are responsible for the exceptional color of this stone. The cat’s eye stone (Lehsunia) is a cabochon stone which is considered to possess a high amount of fibrous inclusions. Therefore, the “cat’s eye” is a line of light that mirrors from the dome of the cabochon at right angles to the parallel inclusions. The line of the cabochon stone appears identical to the thread of silk that will generate a line of reflection crosswise top of the spool while this stone is moved back and forth inside the stone. The hardness of cat’s eye stone is marked 8.5 on Mohs scale and it is an extremely hard stone. 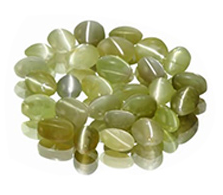 There are ample numbers of chrysoberyl gemstone, however, the most distinct and popular among item is cats eye stone. The striking golden line of light passes exactly middles the middle of the stone and blesses this stone with the appearance similar to cats eye. Since ancient times the Chrysoberyl gemstone cat’s eye (Lehsunia Stone) has been regarded as being one of the most magical gemstones and it acts as a talisman. It is being said about this stone that it brings wealth and intellect to a person. The cat’s eye stone is extremely difficult to locate. However, a treated cats eye stone can be easily spotted, but, a natural cats eye stone is found in very limited regions around the world. This Chrysoberyl type stone is one of the most fascinating and interesting gemstones due to its sheer appearance alike cats eye that sometimes perplexes human being that is it original or fake. In order to identify a cat’s eye gemstone whether it is original or fake it should be kept on the bone for 24 hours and if it creates a hole through the bones then it is a natural cats eye stone. The other way to identify a cat’s eye stone (Lehsunia Stone) that a natural cats eye stone contain two, three spool thread which keeps rotating inside the stone. Thus, if the stone does not have threads inside it, then it is not natural. The color of the cat’s eye stone ranges from milk, honey to mint green so these are considered the best colors for cats eye stone. How To Buy High Quality Cats Eye Gemstone In India?